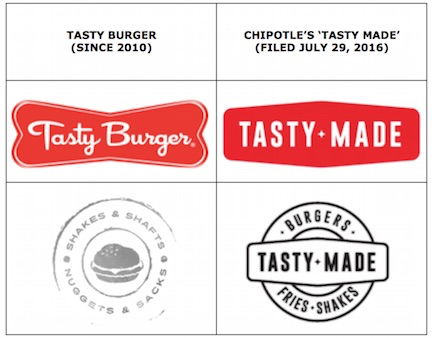 Back in August, East Coast burger chain Tasty Burger sent a cease-and-desist letter to Chipotle over its trademark for the company’s new burger venture, Tasty Made. Now that the latter has opened its first location — in Columbus, OH, as of yesterday — Tasty Burger says it’s making its opposition to that trademark formal. Tasty Burger says in a statement that it’s filed a consolidated notice of opposition to all Tasty Made marks filed with the United States Patent and Trademark Office, in an effort to “aggressively protect the Tasty Burger mark and its goodwill from any mark that causes confusion” amongst its customers. Tasty Burger says it seems that Chipotle has decided to just do as it pleases. “Frankly, as a $12 billion Goliath, Chipotle knows full well an independent business like Tasty Burger only has two choices: stand the ground and weather the storm both financially and legally, or let them steamroll over us,” the chain says.